The Hub advice, support and counseling centre in Ballynahinch has opened its new premises at Windmill Street in the town. The partnership of churches with organizations across the voluntary and public sector has brought a much-needed range of services to the heart of the Ballynahinch community. One of the main pillars of the organization is to provide a professional counselling service which is funded through the Public Health Agency and a number of charitable funding sources. 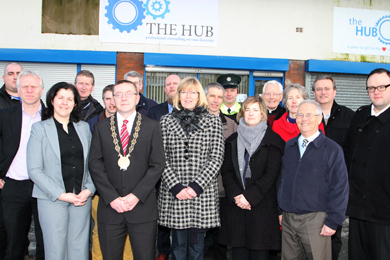 Members of The Hub team with representatives from the local churches in Ballynahinch and voluntary and public organisations at the opening of the new premises. This work plays an important role in combating suicide which has taken the lives of a number of local people in recent years. A range of services is on hand to help people deal with issues such as bereavement, relationship problems, stress, anxiety, mild depression, self-harm and suicidal thoughts. Deborah Boden the new centre Manager, co-ordinates the support system and said: “We have trained volunteers to this strand of work. The Hub is now open five mornings a week as well as some afternoons and evenings. Counsellor Davy Hutton, who oversees the counseling role of The Hub, said, “The Hub emerged a couple of years ago from the old Ballynahinch Suicide Task Force steered organised by social worker Pat McGreevy. It was the first real integrated response to addressing the needs of local people in Ballynahinch in a suicide preventative context. The Hub was started by the local churches and is supported by our Ballynahinch Down District Council Councillors to address the difficulties over the years with suicide in the Ballynahinch area. “Our councillors are either accredited at BACP/ACC level or are working towards accreditation and all are bound by a Code of Ethics. All of our counsellors receive professional clinical supervision themselves to support their work. We have a team of eight altogether. “The Hub is about reaching out and our partnerships at local level will go a long way to helping to meet the needs of people in Ballynahinch. “If someone wishes to talk to an adviser or counsellor we can arrange that within a week, and in more pressing circumstances we will make arrangements to meet a client. “Our role can be quite wide. We even liaise with local police teams and help address issues such as anti-social behavior before it gets out of control. Sometimes we get referrals from local agencies. We have seen quite a number of positive turnarounds as young people respond to our intervention. “The service we provide is free to everyone. If a person is concerned about someone else, particularly if they think that they may have harmful thoughts and be suicidal, we can talk to see if there is a solution. Early intervention often prevents a development from spiraling out of control and then taking much longer to deal with. Ballynahinch Down District Councillor Mickey Coogan said: “I am delighted to see The Hub now moving forward and providing essential services fro Ballynahinch. A great deal of voluntary effort has been put together and many people are very much committed to making this service work. The voluntary workers involved in The Hub are helping to bring a vital service to the people on the ground who need it.